A richer narrative of light should take place in the urban context transforming it in a bright new landscape, characterized by an immense visual variety that permeates the walls of buildings, roofs, sidewalks down to the streets in micro and macro elements of light, reversing the conventional relationship between ephemeral and permanent, public and private, between real and illusory: new scenarios, models and forms of street lighting for new experiences, values and conceptions of public space. Within an urban context in continuous reconfiguration, characterized by a multiplicity of overlapping functions and towns in search of urban living, the investigation into the relationship between light and man is aimed at the recovery of zero floor, to use a shared, immersive and experiential rebuild relationships of trust between individuals and from the space city. 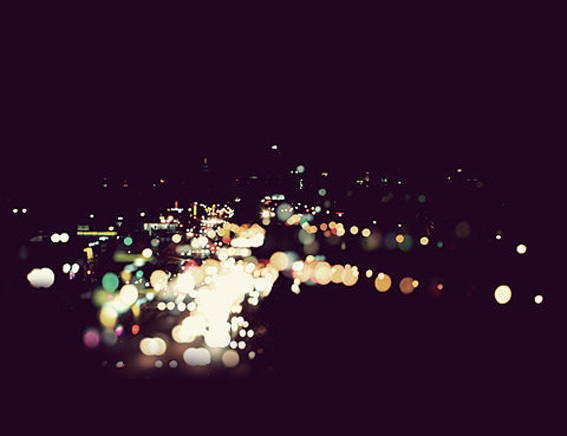 (F. Burkahardt, 1998) In this scenario, new lighting technologies and controls may contribute to redefine the urban space and the same design of public lighting in a more reflective and ecologically responsible. X-LED, is the latest “State of the Art” medial design feature which integrates into the architecture during the day and stages fantastic displays at night. It is an array of LED (light emitting diode) modules mounted on stainless steel netting designed and produced by Carl Stahl, the well-known manufacturer of stainless steel netting in Süssen (Baden-Württemberg) Germany, was presented at the ‘Textile Architektur’. 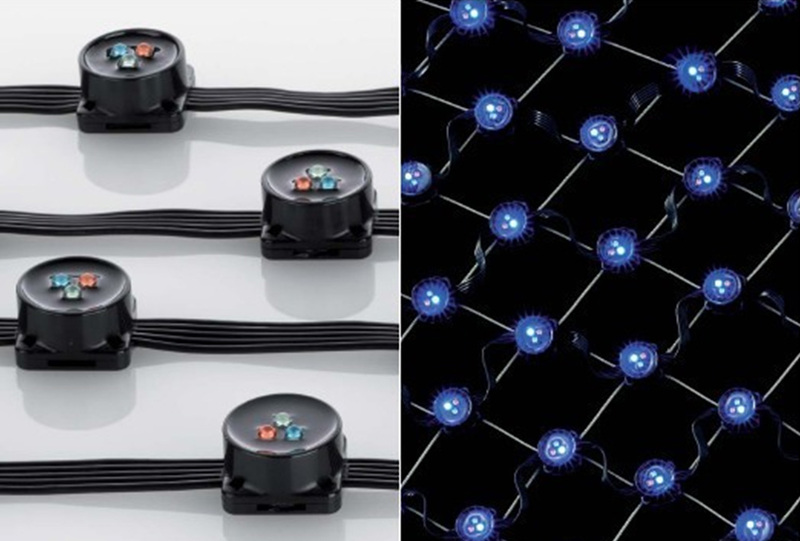 X-LED is a combination of the X-TEND stainless steel netting and LED system of lighting modules. This novel architectural design element enables media to be projected onto two-dimensional surfaces, turning them into three-dimensional bodies. 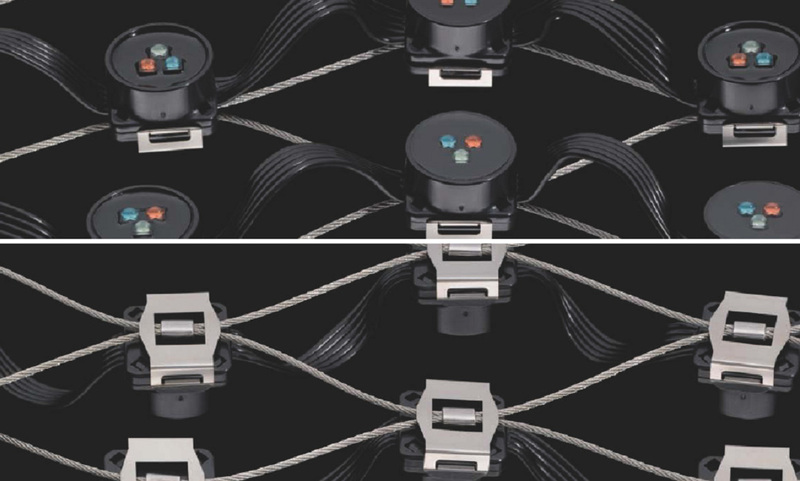 X-LED is mounted on a network of thin steel support cables, which form an open-frame structure with mesh openings between 40 and 300 mm. 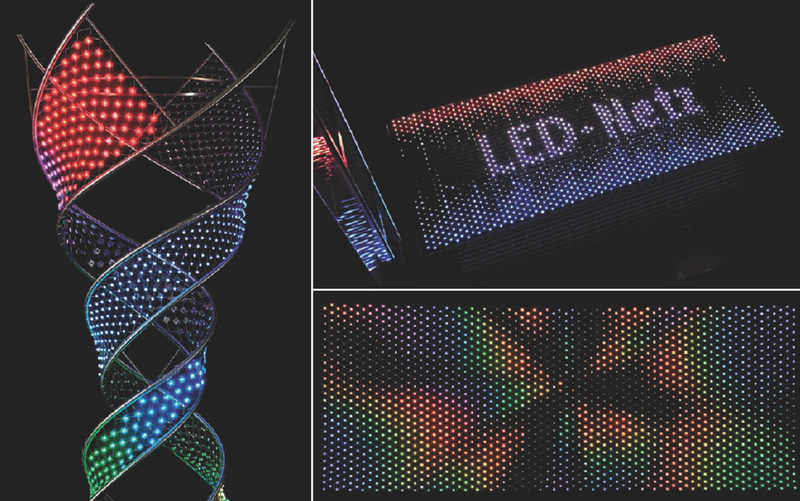 Moreover X-LED consists in programmable colored LEDs that have been mounted on this netting to create an illuminated display of virtually any imaginable size. Individual LEDs are controlled by integrated microchips, which permit precise imagery projection and uniform color schemes. From micro dots of light to large-scale displays that are also a „big“ part of open-air concerts, outdoor performances and exhibitions. Where conventional plasma displays have serious problems in terms of weight and wind resistance, X-LED is the advanced open-frame X-LED display, which gives an exciting new technology for projecting images, videos, animations, logos and texts – on two as well as three dimensional surfaces. 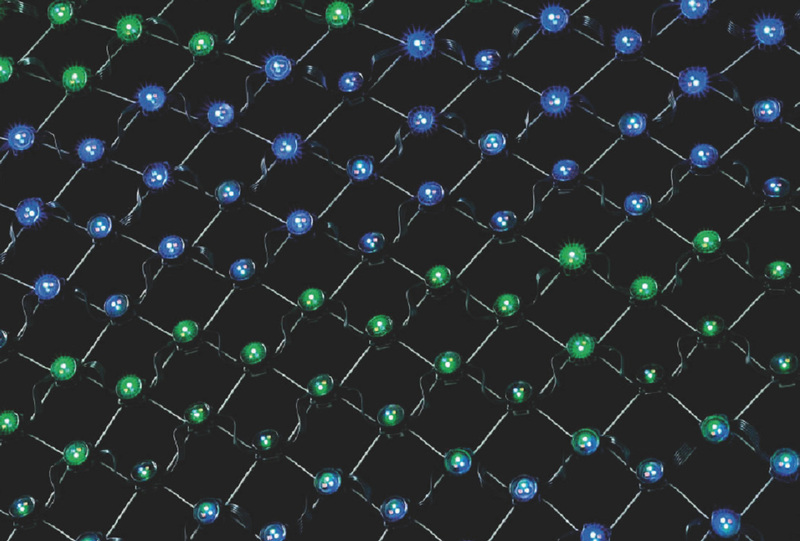 In addition, the X-LEDs diode-covered netting has the same color fidelity as a plasma display but with a significantly higher transparency of over 75 %. As a result, the X-LED is brighter and extremely flat – having a thickness of only 20 mm. Thanks to its open-frame netting the X-LED weights only 4 kg/m² (based on mesh opening 90 mm) and it has a lower wind resistance. These two facts make the X-LED perfect for outdoor advertising or open-air events. Suitable for stage sets, exhibitions and building facades, it presents an unlimited capacity for graphics and animations. It suits outdoor application because it is weather and wind resistant thanks to stainless steel netting: the X-LED fulfils all IP 66 safety requirements according to DIN EN 60526 and is even protected against heavy rain or dust. Only the control unit and the power supply require weather-proofing. An inspiring application of the X-LED is on a building’s facade: for example as an enormous, illuminated display during renovation or construction projects. Here too, the X-LED offers a practical advantage: sunlight can pass through its steel netting to illuminate the building’s interior, which is not possible with conventional billboards. Plus, because the X-LED can be programmed for an unlimited range of motifs, logos (including specialized color schemes), and fixed as well as moving images. X-LED has persuasive attributes such as low self weight and the flexibility of size and formation of the applied face or body: they can be applied even on 3d-models supports. The presentation of moving pictures, animations and video content was paramount during the development of X-LED. In addition to the facility of a video presentation, the X-LED system offers a maximum transparency whilst offering the best quality video display. Another advantage of the X-LED is its dual-mode video interface, using both DVI and VGA inputs. Here computer generated photos, logos, texts, animated clips and video files can all be projected using either the DVI or the VGA video standards, which have different brightness characteristics and image sizes. 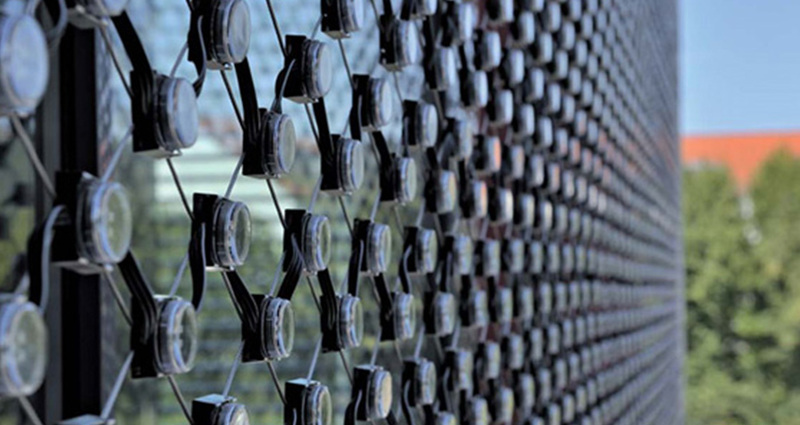 Overview: Set to be placed on the facade of non-traditional Forest Hotel in Barcelona, Artificial Leaf is a system that drapes the light into modules suspended on a steel mesh. The scheme is based on the analogy that if a city is a forest, each building is a tree. The network, whose nodes are composed of modules, is therefore metaphorically a floating canopy of a tree whose leaves, as in a natural system, are useful both to accumulate and consume energy produced by the sun. Architecture of the system: Each module is a convex disc that is 32 cm in diameter and about 5 cm thick at the center. One side is made of translucent plastic and the other from clear glass. In each disc there is a small photovoltaic cell, a light sensor, a battery, and a RGB LED. 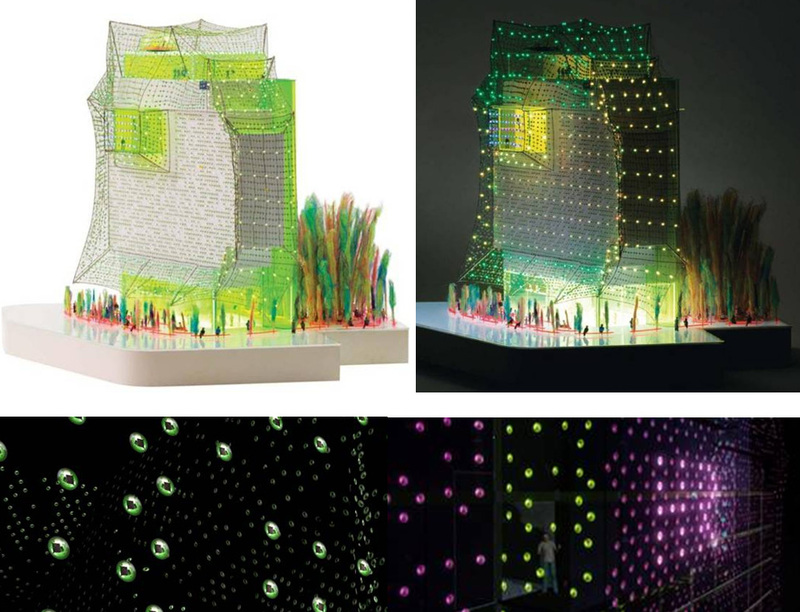 The modules are attached to the steel mesh and are programmed in tandem to create a colored light with different intensities and different effects of mixing RGB to create multi-color illumination of the entire facade. The goal is to make the facade of the building a dynamic element within the urban landscape, and thereby engage the public with the built environment. “is a way of inducing a building envelope, often rather boring to offer something truly spectacular for the city, in its ability to react and respond to urban context,” said Chris Genik. This is a level of interaction on which cities will have to invest more and more”. It is also a device potentially useful for other network applications, either as a continuous and dynamic renewal of the facade and also to collect energy. It is, in fact, a flexible system to different types of installation because you are not bound to structures and existing facilities. The modules and the network can cover a building or other urban elements like a fabric that is able to illuminate unconventionally the space of the city. Location: The installation of the prototype of vertical and horizontal surfaces of buildings or public ornament has been tested in Eden Court, Inverness (Scotland) and a short version will be tested even float. Overview: This is a project of lighting the city’s in an unusual, temporary and creative way that involves the use of a series of interactive LED micro lighting sources and allows the interaction between man and the light in the urban public space. The project is an attempt to break the boundaries between classical street lighting systems for illuminated signs. The urban pixels have a diameter of 100 mm and contain 10 LED light sources in a shape of PMMA that can be mounted on horizontal or vertical surfaces of buildings and outdoors zones. The citizens of the city can interact with the ball by sending SMS that allow you to change the light pattern, or alternatively the system includes a sensor placed inside the pixels to create an effect on / off while you are passing by. Implemented by the MIT Media Laboratory and the Smart Cities Group, the system was tested in a public spacein relation to the interaction and reactions that people have shown. The installation showed that a more direct approach, and especially the simple cause and effect have led to improve the experience of public space. Architecture of the system: Urban Pixels are wireless, self powered by sunlight and it can communicate radio frequency (RF) by creating a distributed network of bright dot. Depending on the configuration and positioning, “Urban pixels” can be used to give specific information on the site, respond to environmental conditions or to support creative expression in the urban public space. 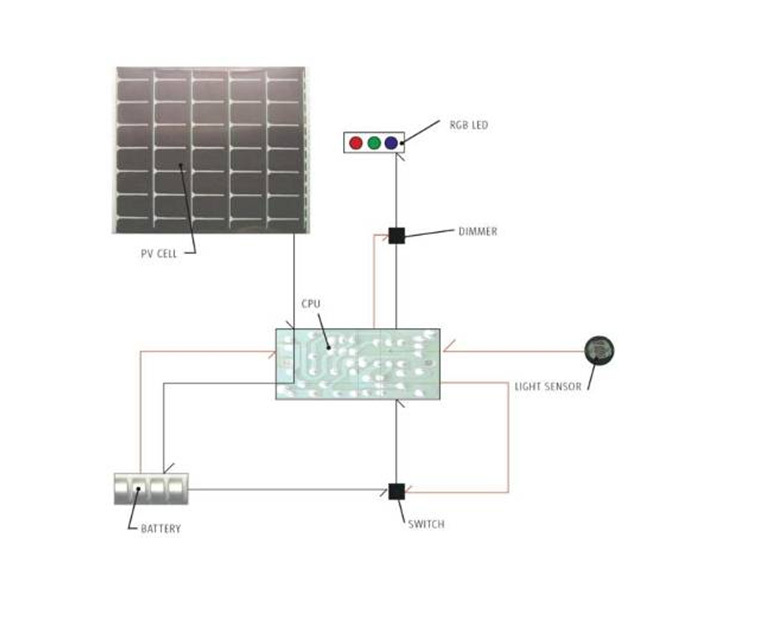 The main components are: RF radio, microprocessor, LEDs, solar cells, batteries. The system now implemented integrates power, communication and lighting. Advantages: self-reporting and communication system; interaction in the experience of urban space. Thanks! The reason is perhaps that the relationship between lighting, city and human being + new technologies and sustainability is a fascinating issue!